The TV show broadcast live on AMGA, is stuffed with lots of facts and figures about the Syrian crisis that the Western mainstream media stubbornly skirts. Steve Stokes, who is running for Congress in the 28th District, California, presented his platform, discussed the Syrian crisis and the U.S. involvement, during the show, on Thursday, October 30, 2014. Rep. Adam Schiff, his contender, declined the invitation. 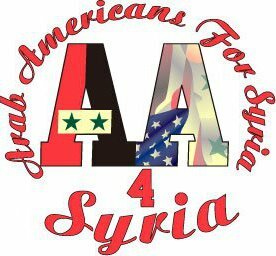 Raise your voice and get involved by joining a NoBombs4Syria.com protest against ANCA’s Endorsement of Rep. Adam Schiff. The protest will take place in front of Beverly Hilton Hotel, in Beverly Hills, on Sunday, November 2, 2014, at 4 p.m. This is where the ANCA Western Region is going to hold its Annual Banquet. Please join us. On ABC TV Live with Vrej Agajanian, Johnni Achi, a member of Arab Americans for Syria group, shares information about the Syrian conflict that is largely avoided by the mainstream media. Steve Stokes and Rep. Adam Schiff, who both are running for Congress in the 28th District, have been invited to discuss the Syrian conflict and the U.S. involvement live on the AMGA TV, on Thursday, October 30, 2014, at 7 p.m. Steve Stokes has already accepted the invitation, Adam Schiff’s response is still pending. Please tune in, so you can make an informed decision at the ballot box on November 4, 2014. Ara Manoogian, Harout Bronozian, and Irena Varjabedian staged a protest in front of the headquarters of the Armenian National Committee of America Western Region, in Glendale, CA, demanding the withdrawal of its endorsement of Rep. Adam Schiff over his stance on the Syrian issue, particularly his support of the opposition forces that are notorious for defecting to the ISIS/ISIL. Please sign the petition at https://www.change.org/p/armenian-national-community-of-america-anca-withdraw-endorsement-of-rep-adam-schiff. On October 23, 2014, the Armenian National Committee of America (ANCA) reaffirmed its endorsement of Adam Schiff, the incumbent House Representative. He is running in the California 28th District, where an estimated 23% of the registered voters are Armenian, and the ANCA claims it is entitled to ‘throw community’s electoral support behind U.S. House and Senate candidates with proven track records on Armenian American Issues.’ (see: http://www.anca.org/press_releases/press_releases.php?prid=2390). Although the ANCA gives Adam Schiff an “A+” score for his ‘proven track record on Armenian American issues,’ it neglected to score his track record on issues regarding his support of the Syrian “moderate” opposition infested with al Qaeda and ISIS/ISIL, which have caused the death of hundreds of thousands of civilians, including Armenians in Syria. For these reasons, we, the people of the 28th District, are asking for the immediate withdrawal of the ANCA’s endorsement of Adam Schiff. We strongly believe that it is not only wrong, but also unethical and immoral for the ANCA to ‘throw community’s electoral support’ behind a man who has put the lives of that very community’s brothers and sisters at stake in Syria by backing forces that have caused death, destruction of property and displacement of scores of civilians all over Syria. A peaceful protest will take place on Tuesday, October 28, at 2 p.m. in front of the ANCA-WR office which is located at 104 N. Belmont St., Glendale 91206. A delegation will hand deliver a letter of protest to the ANCA. Please RSVP at https://www.facebook.com/events/863824850314813/. Please join us and make your voice heard! Please join us at Mainstage Theater/Auditorium of the Glendale Community College, on Friday, October 24, 2014 at 7 pm, for the event “Responding to the Humanitarian Crisis in Syria and Iraq.” Please visit the Facebook Event page to RSVP. USAID has provided around $3 billion in humanitarian aid to its implementing partners in Syria with the aim of helping the Syrian people. A lot of that aid found its way into the hands of al Qaeda and ISISI/ISIL fighters. We will be discussing how Americans can help the civilians of Syria by guiding the U.S. government and congressional representatives to make wiser decisions about U.S. aid distribution so that it does not fall into the hands of terrorists who perpetuate the war and suffering in Syria, Iraq and the surrounding countries.